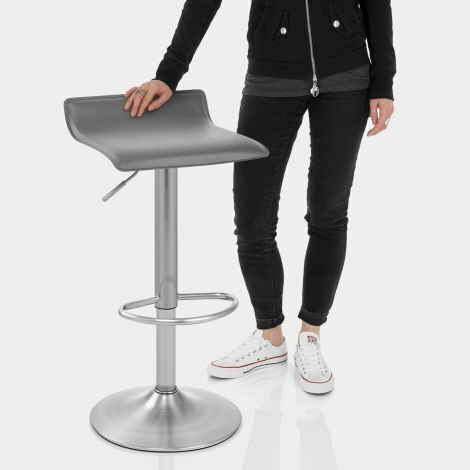 The Mars Brushed Steel Bar Stool Grey combines practicality with modern style, resulting in the ultimate stool for any setting. This clever piece has a compact design, providing a valuable finishing touch to the simply timeless Mars Brushed Steel Bar Stool Grey. Benefitting from its attractive grey faux leather design, the compact seat lightly curves for a reassuring feel on this brilliant backless piece. Hand finished in brushed steel, the contemporary frame is itself a distinct feature and brings the stool straight into the 21st century. 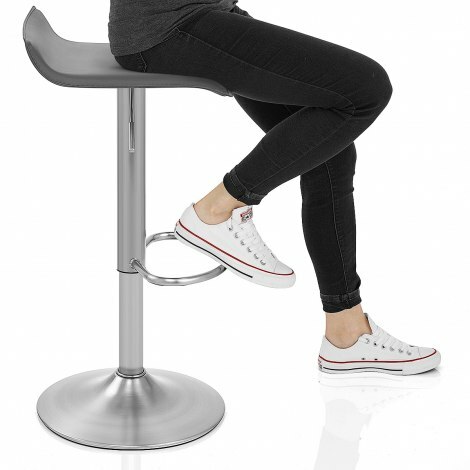 An eye-catching footrest ensures steadiness when seated at any angle, whilst the handy gas lift mechanism enables both variable height and a 360-degree swivel for complete versatility. Finally, a protective ring beneath the circular base helps to look after your floors. "Stunning bar stools that look far more expensive"
Excellent service from seller as I changed my mind about which type of stool to get after an internet order. Rang atlantic up and they were very helpful and efficient. Pleased with stool as it matches two previous bar stools we had. Great high chairs. Good quality and look lovely. Excellent price for the quality. Very happy. Amazing stool, had them in my previous houseshare and wanted the same for my house! easy to assemble and store, good quality! We bought two of these stools last year and like them so much we just ordered another. A year on the other two still look as good as new. Very happy with the quality, ease of assembly and fast delivery. Great value too. I have purchased two Mars brushed steel stools. The overall experience has been very good. Atlantic was recommended to me by a friend. The web site is excellent. clear, easy to navigate and with all of the detail necessary to make a decision. The stools came quickly, on time, were well packaged with no damage, easy to setup, comfortable and look great. A truly great customer experience from start to finish.